REVENGEANCE MAKES IT'S US DEBUT AT THE 40th PORTLAND INTERNATIONAL FILM FESTIVAL ON SATURDAY AT 8:45 PM/LAURELHURST THEATER! 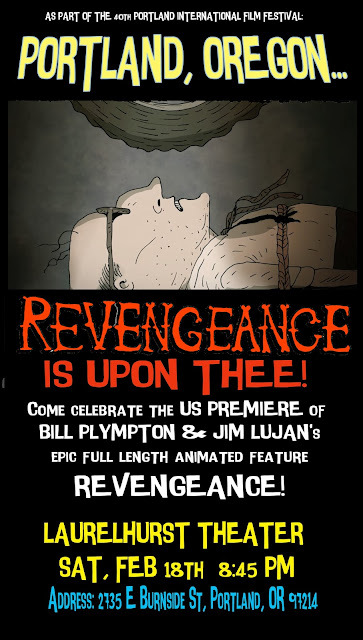 IF YOUARE IN THE PORTLAND AREA, COME ON DOWN AND CHECK OUT THE FILM AND MEET CREATORS BILL PLYMPTON AND JIM LUJAN! IT'S GONNA BE A GOOD TIME, YES IT IS!! ALSO, THERE WIL BE A SCREENING AT THE WHITSELL AUDITORIUM AT 2:45 PM SUNDAY!